What to do when you notice symptoms of dental caries? Dental Caries Symptoms - What to do next? Tooth decay, referred to as dental caries, is commonly noted in children, although it may affect individuals of all age groups. It is one of the main reasons of tooth loss across all age groups. However, recognising and addressing dental caries symptoms at early stages can prevent pain as well as loss of teeth. Dental caries is caused by the bacteria that normally reside in the mouth. These bacteria can often stick to the tooth with the help of a sticky film called plaque. The bacteria utilize the food debris (especially sugar based) and during this process release certain acids which can damage the teeth. This process eventually causes dental caries. If you notice any of the dental caries symptoms mentioned above, you should schedule a visit to the dentist to a proper dental treatment. Dental caries can also be detected during routine dental checkups. Hence, it is important to visit the dentist on a periodic basis. The treatment option offered by the dentist depends on the extent and severity of dental caries. Some of the commonly advised treatment for dental caries is listed below. This is the commonest treatment followed to treat dental caries. 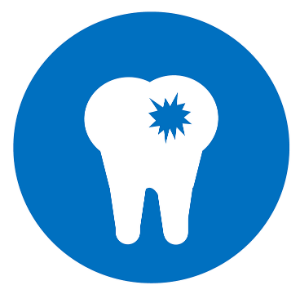 The dentist removes the damaged portions of the tooth using a drill and fills the cavity using a filling material. These materials may be made of silver alloy, gold, composite resin or porcelain. In those who are prone to caries, the dentist may apply a liquidy filling material called a sealant (which is hardened by exposing it to ‘blue light’). Teeth which have been extensively damaged because of dental caries may require the placement of a crown or a cap, which envelopes the complete tooth structure. The crowns may be made of porcelain, gold or metal alloys. The tooth is trimmed before placing the crown and the crown (which is fabricated at a dental lab) is cemented to the tooth. This treatment is usually advised if the dental caries symptoms are quite severe. Decay which is deep can infect the tooth pulp (which comprises blood vessels and nerves) causing severe pain and swelling. This generally occurs if the dental caries is not treated during the initial stages. The dentist clears the tooth pulp and fills it with a root filling material and seals the cavity. A crown is generally advised after the root canal to protect the tooth. Dental caries symptoms are often ignored as they do not last for long and occur occasionally during the initial stages. It is hence preferable to visit your dentist nearby on a periodic basis to ensure there are no cavities and to get the cavities (if noted) filled at the earliest.